Computer numerical controlled machining centers have quickly become the go to method for producing complex mechanical components to exacting standards. Machining centers interface with computers to make finished parts that are nearly identical to the designer’s original vision. In addition, these parts can go from nothing more than a good idea to a tangible product in as little as a matter of days. The very same factors that allow for such accelerated production also allow for product updates on the fly in much the same way as the accepted digital software paradigm. This means additional fiscal savings; seeing as a design flaw is constrained to a much smaller stock of units as opposed to a massive production run. In many cases, goods can be constructed from raw materials on a made to order basis, which lowers the often-prohibitive investment costs and encourages innovators to, well, innovate. 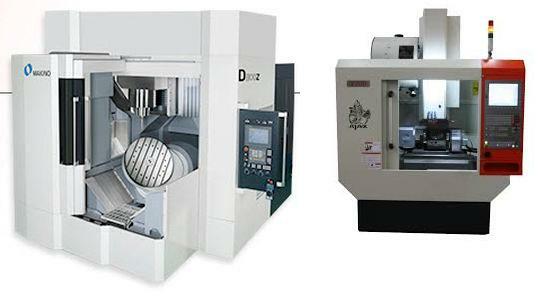 The first CNC machines were mills that were constrained to operating only in the X and Y axis, and although revolutionary in the nineteen fifties, two axis mills would prove to be child’s play compared to the five axis mechanical monsters available today. Both the Makino D800Z 5-Axis Machining Center and the Ajax V700i 5X represent the cutting edge, no pun intended, in CNC machining, but for distinct reasons. The V700i 5X is fitted with high specification iTNC 620 Heidenhain control and boasts a 12,000 rpm/20 bar coolant option, chiller, a 200 mm diameter rotary/tilt table, 24-tool magazine, has a table size of 800 by 400 mm and axis travels of 700 mm in X, 400 mm in Y and 550 mm in Z with the option of greater Z-axis travel of 650 mm. In addition to the touchscreen feature, the machine, with full ISO programming, also has the ability to be used in manual cycle mode through the electronic hand wheel. In terms build specs; the machine range is built on heavy-duty beds each with hardened and ground ways, and spans centre heights from 180 mm on the Evolution 3 AJEV 180 to 500 mm on the largest AJEV 500. What this all means for the end user is; higher efficiency, lower cost, increased surface precision, and very low potential for collision damage. A number of spindle options ranging from 12,000 to 20,000 rpm offer adaptability for increased utility. Much like the aforementioned Ajax V700i 5x, Makino’s offering provides the unparalleled stability that is crucial for meeting precise specifications for machine parts. In fact, the entire system remains rock solid up to its 1,200 kilogram load capacity. The Makino D800Z 5-Axis Machining Center and the Ajax V700i 5X are both testament to the wide range of options available to the modern machinist. It is truly a thrilling time to be a modern engineer with such a wealth of technology available at your fingertips. Since its inception in the aerospace sector CNC industrial technology has only proven that the sky is, in fact, far from the limit.